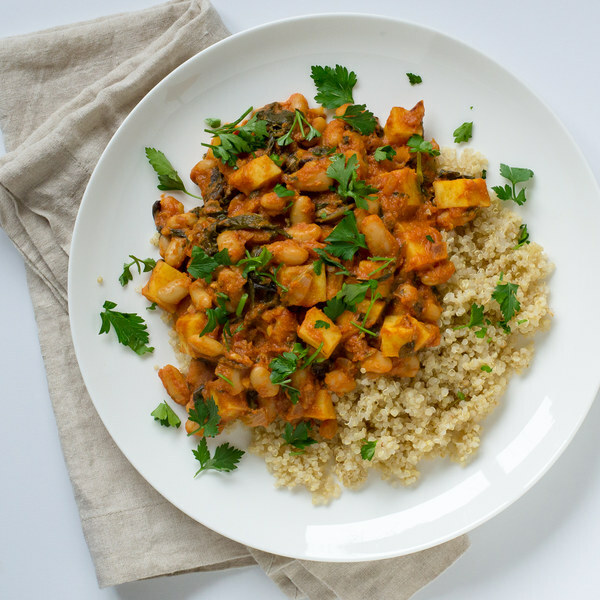 ← Sweet Potato, Spinach & White Bean Curry with Quinoa. In a small saucepan, combine the quinoa, salt, and water; bring to a boil over high heat. Peel and medium dice the potatoes (cut into ½-inch cubes); transfer to a bowl. While the skillet heats up, trim off and discard the ends of the onion and remove the outer layer; small dice the onion (cut into ¼-inch pieces). Add the onion to the skillet; cook, stirring frequently, until it is softened, 3 to 5 minutes. While the onion cooks, trim off and discard the root ends of the garlic; peel and mince or press the garlic. Peel and grate or mince the ginger. Add the garlic, ginger, and curry powder to the onion; stir until fragrant, 15 to 30 seconds. Add the sweet potatoes, tomato sauce, broth, and salt to the skillet; stir to combine and reduce the heat to medium-low. Cook, stirring occasionally, for 10 minutes before adding the remaining ingredients. While the curry cooks, using a knife, shave the parsley leaves off the stems at a downward angle, working away from your body; discard the stems and roughly chop the leaves. Add the beans, spinach, ¾ of the parsley (save the rest for garnishing), and yogurt to the curry; stir to combine and continue cooking until the potatoes are tender, another 5 to 7 minutes. To serve, place the quinoa on a plate or in a bowl, top with the curry, and garnish with the remaining parsley leaves. Enjoy!